Properties in The Mines Golf Club average 4.1 out of 5 stars. Property 46: Bukit Bintang 2 Bedrooms Luxurious Home For 6 pax. 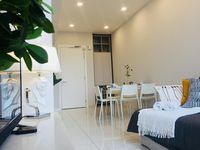 Property 47: Bukit Bintang 1 Bedroom Luxurious Home For 4 pax. During my initial booking I have asked Simon to prepare me a baby cot as my relatives is coming over with a 1-year old baby. Simon is so kind to purposely purchase and prepare a baby cot and bathtub for us. He even suggest us tons of different places that we have never explored before during our trip to KL. definitely worth the stay here.